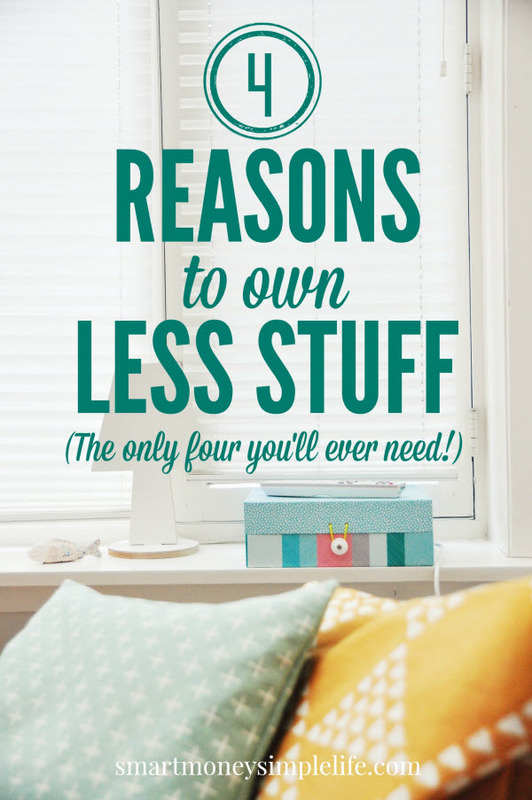 Reasons to own less stuff… How many reasons do you need? I’m all for owning less stuff and have been working on shedding the excess from my life for a few months now. It can take a while to get through all the accumulated bits and pieces that clutter our houses and our lives. Especially after living in this house for over a decade. I was doing really well in my efforts to clear out the unnecessary and free up some space in my cupboards, as well as my brain. Then my home and contents insurance renewal came. And, a sense of urgency struck. You see, the bill was a bit of a shock. It was a lot more than I was expecting. Over $1000. I don’t live in a palace and I don’t own expensive pieces of furniture or grand pianos or Persian rugs. $1000 kind of blew me away. It also got me thinking… Do I really need that much insurance for my contents? The house, yes, but my contents? The contents of my home are insured for around $80,000. At this point I’m not sure if I have too much insurance or too many contents. I think it might be a bit of both. As I look around the house, I’m a little bemused as to how I ever arrived at that number. Sure I have a lot of books. And a lot of DVDs. Actually, way too many books and DVDs. But I couldn’t figure out how, when I first organised this insurance many years ago, I arrived at that number. Would I bother to replace it if my house burned down? If I’m honest with myself, there are probably very few things I would replace if they were lost in a fire (or the house was hit by a meteor). As my insurance is due to be paid before the end of this month, I have a small window of opportunity to go through the house and be totally brutal in my culling efforts. And, therein lies just one money reason to own less stuff – you pay less insurance. If I can seriously reduce the value of the contents to be insured, I can seriously reduce the amount of insurance I need to pay. Which, coincidently, also makes me happy, free to do other things with that money and reduces my stress because my bills are lower and I have less stuff to worry about. I get to tick all four Reason boxes. Here are some more to get you thinking. It gets easier to see how all the reasons for owning less stuff invariably come back to these four concepts: Money, Happiness, Freedom and Stress. There’s a lot of cross over between them, too so you get multiple benefits for each reason for owning less stuff. less stuff means you can live in a smaller space which usually costs less. you know you’re contributing to a cleaner environment. you’re no longer a slave to the marketing machine. you don’t fear an unexpected knock on the door. These are just a few examples of how more money, more happiness, more freedom and less stress are the only reasons you need for owning less stuff. What other examples for each reason can you think of? Some might be specific to your situation but there’s a very good chance they’ll apply to others, too. And, we might not have thought of them before. So, please share them in the comments. About home / tenant insurance, here are a couple of tips to lower your premium – besides the usual of age, length of time covered by same company, number of claims, etc. I noted a couple of years ago the amount of contents coverage on my tenant insurance also seemed high and I did a bit of estimation of replacement value (the coverage type I have) and spoke with my agent. I found out that there is a minimum content value required by the policy – and I reduced my level down to that level, and also sent a letter to her (her request for my file) that this level not be increased unless I request it. Otherwise it is automatically increased every year, if I recall correctly. I forget how much this took the premium down – though tenant insurance is less than house – I think my current premium is about $250 (due end of this month also.) Another one is the deductible – I have $500 and a note with the policy renewal this year says that by increasing the deductible to $1000 the premium would decrease by 15%. I am not doing this for now, but likely in future. I have been reducing ‘things’ for years – and when I last moved 7 years ago (from one apartment to another, still 725 sq ft) much was reduced – eg I limited myself to 6 boxes of books, 1 large bin of sewing stash, 1 large bin of knitting/yarn stash, and Goodwill got a large amount of ‘stuff’. Mind you, occasionally I think I would have liked to still have one or 2 things, and I have acquired a few more boxes of books . . .
I’ll definitely be chasing up the insurance value of the contents. Something odd going on there! Less clutter! Less cleaning up your stuff! When the white man first came to America’s shores, very shortly, Native Americans could tell that they suffered from a spiritual illness which was manifested by an intense desire to possess things. I think this illness is a large part of what is wrong with us today. I am guilty of it, but trying to adapt to a different way of life. My main difficulty is when I see something beautiful, i.e., a rug, a painting, I want to own it so that I can enjoy it every day. Somehow, I need to find a way to channel this desire into something else. Thank you for giving me some things to think about on my journey. God bless. Thanks Gail. I’m the same when I see something beautiful.